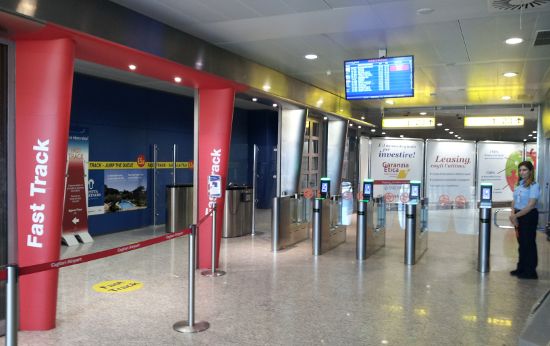 The Fast Track service, the quickest route to the Departure area through security, is available at Cagliari Airport. The access to the dedicated security lane is granted from 5.00am till the last boarding with a 5€ fee to travellers who prefer to save time for relaxing or shopping at the airport. Tickets for the Fast Track express lane are sold by an automated machine located before security controls (payment by credit card, ATM card or cash). The Fast Track service is also available for all major Airlines willing to pamper their premium passengers. Please note that pre-paid vouchers (the cost of 10 vouchers is 50 €, 20 vouchers cost 100 €) and annual passes for the service are available. Fast Track Card holders are granted unlimited access for 12 consecutive months for the price of 120 euro. The card is non-transferable. Vouchers and cards can be purchased at the Multi-storey car park cash counter or by wire transfer. Ask for details at info@sogaer.it.